With just one song released stateside, that did not deter the crowd at the nearly packed room at Alice Merton's first LA show. Spurred by the popularity of 'No Roots', the show was filled with a surprisingly upbeat vibe. Having grown up in Canada and Germany, Alice channels the sensibility of her travels of her music. The set was filled with uptempo songs, but also included a few slower tracks as well. Alice kept the crowd's attention with each track. Now, based in Berlin, her band consists of people she met while in music school. In between shows, she is currently working on her long awaited debut album. Kicking off the first night of her headlining tour, K. Flay did so in energetic fashion. Playing tracks from her latest - Every Where Is Somewhere as well as from her previous full length, Life as a Dog, she had the crowd hanging on to every word. 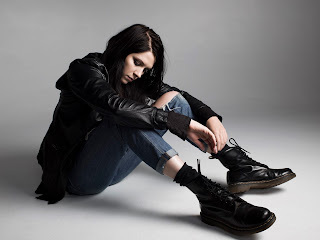 K. Flay has slowly, yet steadily built up from her previous releases; in the midst changing labels as well as switching up her home base from opposite coasts (NY - LA). Through the process, her sound has also evolved, into a mix of an alternative/indie/rock conglomerate. This was evident tonight, as she maneuvered through the songs, and also including a couple songs she was featured on. It wouldn't be complete without throwing it back to one of her earliest tracks - No Duh, which she did minus the band, which includes - Josh Lippi on guitar, Will Baldocchi on drums, and JT Daly on guitar, xylophone and keys, who also produced half of Every Where Is Somewhere. With Hollywood Forever set as the backdrop, Emily Haines started the show in theatrical fashion. It started out as a bit of a one woman play/show, complete with a bed and other props sprinkled on stage. With suitcase in hand, Emily took stage. A voiceover version of herself taunted her, trying to pull her back. Eventually, that led her to the piano to start off the set as she jumped right into the songs. After a few songs, her band – The Soft Skeleton, which included her Broken Social Scene band mates Justin Peroff on drums and Sam Goldberg on bass as well as her Metric cohort Jimmy Shaw on guitar, joined her. Playing both old, from her album – Knives Don’t Have Your Back, as well as new, her latest – Choir of the Mind, it was a fine tuned balance of the songs spanning over 10 years between the two records. The songs blended in nicely and complimented each other; simple, yet complex, delicate, yet powerful, flowing like air, while cutting like a knife. A trio from Chicago, Monakr consists of Saam Hagshenas, Jonathan Marks, and Matthew Santos. Here, they give a little insight into the band. 1. What inspired you to get together and start a band? We had all known each other through the Chicago music scene, our bands had played together, etc. There was a little talk of working in some capacity. In 2014 Saam had written a few songs he wanted Matt to sing on, and they got in the studio. They both liked the result so much they decided to turn it into a band. 2. Who are some inspirations for the band? 3. Was there a deliberate construction in the outcome of the songs? Not really, every song is different. Some pour out all at once, some are different ideas that come together from different places and times. We knew the mood for this project was a bit more somber than former projects, but I wouldn’t say that influenced the writing process. They’re just songs. Tashaki Miyaki are a duo consisting of Lucy on drums and vocals and Rocky on guitar. 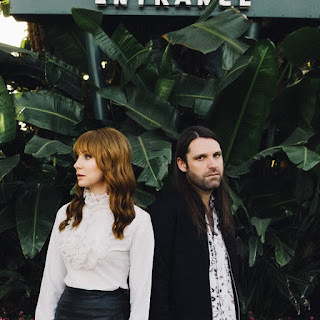 Based in Los Angeles, they formed out of a late night jam session, and here Lucy gives some insight into the band that goes by the name Tashaki Miyaki. 1. What inspired you to form a band? Maximo Park are a 4 piece consisting of Paul Smith - vocals, Duncan Lloyd - guitar, Lukas Wooller - keys, and Tom English - drums. Based in Newcastle upon Tyne, they are a band with an alternative/indie vibe and sound. They create soaring melodies melted with intricate lyrics. Here, Tom gives some insight into the band. 1. How did you guys approach this record compared to the others? It's the first time we've self produced an album. We fell into it by working on a few songs at the end of 2012, intended for an ep in 2013. We did them in Field Music's studio in Sunderland. They're old friends of ours and they helped out a lot on those songs. The label heard them and just told us to keep going, abandoning the idea of an ep. Meanwhile, our own studio space in Newcastle had been renovated and we were able to upgrade our recording set up. So we moved back in and finished the job over the course of last year.